Wear for 8-10 hours then remove pad. Wipe surface with wet towel until its no longer sticky. Used patches will appear dark greenish or grayish as they absorb toxins and waste matter from your body. Continue to use each night until the discoloration of the pad subsides. Step 2 - Tear down the bigger paper on the adhesive plaster, then attach the foot patch onto the adhesive plaster. The side which printed with letters should be pasted onto the adhesive plaster. The letters printed on the foot patch should never touch your skin. Step 3 - Attach the foot patch which is already in the adhesive plaster now onto your feet. Step 4 - Tear down the smaller paper on the adhesive plaster. Step 5 - Attach the whole adhesive plaster onto your feet firmly. Step 6 - Please use the foot patch while you sleeping, and ensure to attach the foot patch for more than 6 hours. If possible, we strongly recommend you to attach the foot patch for 8 hours. Step 7 - Next morning, tear down the foot patch bag and clean the skin. Step 7 - Next moring, tear down the foot patch bag and clean the skin. Step 2 - Tear down the bigger paper on the adhesive plaster, then attach the foot patch onto the adhesive plaster. The Side Which Printed With Letters Should Be Pasted Onto The Adhesive Plaster.The letters printed on the foot patch should Never touch your skin. Step 2 - Tear down the bigger paper on the adhesive plaster, then attach the foot patch onto the adhesive plaster.THE SIDE WHICH PRINTED WITH LETTERS SHOULD BE PASTED ONTO THE ADHESIVE PLASTER.The letters printed on the foot patch should NEVER touch your skin. 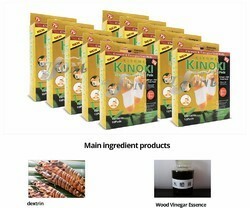 Its the natural way to assist your body in the removal of heavy metals,metabolic wastes,toxins and other chemicals. 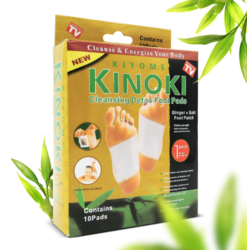 Detox foot pads provide the one-two punch of powerful detox ingredients in conjuction with tourmaline, a mineral that generates negative ions. 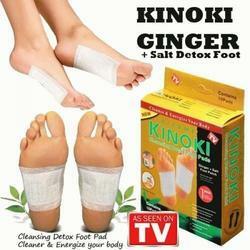 This helps to capture toxins your body eliminates through the outer layer of the skin. The patches are adhered like a big sticker to the soles of the feet overnight. At first, most people use the pads on the arches of the feet. Every night, a new patch is applied to your foot. Successive nights should result in a gradual lightening of the patch. 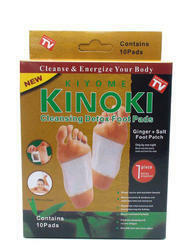 We are the wholesale suppliers of Kinoki Detox Foot Pads in large volume and in excellent quality.